For some time I have been working with the idea of accepting depression rather than trying to fight it. That’s an approach to therapy based on mindfulness and an attempt to broaden the range of experience you can live with comfortably. Although I haven’t worked with a therapist trained in any of the acceptance and mindfulness therapies, some of the principles I’ve been learning about remind me of things I have been doing for some time. Granted I have developed these skills while holding to the very mindset about depression that these therapies counsel against. I’ve tried to fight, control, avoid and eliminate it. The alternative view is to start with the idea of accepting depression while living the life you want. Despite coming at them from the opposite direction, I’ve developed a few skills and beliefs that make the paradigm shift a little less drastic than it sounds at first. These have helped me recover enough to live mostly untroubled by depression despite the recurrence of various symptoms. That’s a big accomplishment. It’s the sort of recovery I had hoped for, but depression remains on my mind. I spend a lot of time trying to control the problems that do come back – especially the thinking that reminds me what a mess I am. I’m very good at turning off that noise, but it keeps coming back, along with other symptoms. At times, I’m listless or irritable or feel rage returning or stare blankly into space or get anxious about seeing anyone. I catch myself in the midst of these tendencies, and the simple act of recognizing them keeps them at a distance. I don’t get overwhelmed. I don’t feel like I’m having a recurrence of depression. They don’t last long or keep me from doing what I want to do. These are shadows of their former selves, but controlling and getting away from them keeps drawing my attention back in their direction. I feel distracted too often from getting on with the positive side of my life. I spend more time than I like pushing them away. Could this be why strategies designed to support recovery could wind up derailing it? It’s hard to be honest with myself about this. I have a lot invested in the idea that I am recovered, that I have depression under control, that it no longer dominates my life. But there remains a nagging anxiety about something that I can’t quite identify. It feels like a holdover from the depressive belief that I’m putting up a false front to cover my inner emptiness. My first reaction is to deny that I could be slipping back, but then the nervousness creeps in. My sense of self-esteem seems shaken again, and I know I could so easily slip back into fearing the return of depression. That would mean the half-recovery of managing depression while constantly looking over my shoulder, cautious that I might make a wrong move and lose myself. That’s exactly the state of mind that results from seeing depression as an illness that I have to control, that focuses on the danger of recurrence, that captures everything suggested by the idea of avoidance. I like Tom Wootton’s way of putting it in The Depression Advantage. Depression isn’t fully in my comfort zone. I have yet to be able to live the difficult moments of depression with a balanced awareness instead of anxiety. I have a long way to go before I can genuinely accept the full range of depressive experiences without hitting the fear trip-wire. I’ve always thought of recovery as a process, and acceptance seems to be the next step. It’s easy to get fooled by the words when acceptance and avoidance are paired as opposites. That makes it sound like moving from one to another takes place in a single leap. On an emotional level, you need to work gradually toward the change, first by learning new skills. The promise as well as the difficulty of this process of learning became clear to me when I started watching the TV series, Obsessed. I’ve described this before, but it’s well worth coming back to. Each episode captures the dramatic moments of change as people with obsessive compulsive disorder work with therapists to confront their worst fears. There couldn’t be more powerful examples of lives dominated by avoidance. OCD itself is a set of detailed actions to wall out the panic that seems to follow inevitably from triggering events. The story of one woman had an especially powerful effect on me. She had developed severe OCD after several traumatic events that had culminated in the death of her father in a terrible freeway accident. She kept the torn and bloodied clothing he’d been wearing at his death and periodically felt compelled to wear the shredded garments. Driving provoked deep anxiety, and the thought of using the freeway set off panic. These were only the worst of many obsessive behaviors that had drastically limited her life. A cognitive behavioral therapist taught her cognitive skills to cope with the ideas and feelings at the heart of her problem. His main concern was to use that training as preparation for guiding her to do the things she most feared. She needed to expose herself to dreaded situations in order to defuse and accept them as part of normal living. After she learned to handle smaller behavior changes, she had to confront her worst nightmare and drive through the freeway section where her father had died. Despite her resistance and intense anxiety, she passed the spot where her father’s car crashed. She gradually relaxed as she realized she had done it and survived. There was no nightmare. Is Depression Something I Do? Could the same thing happen with depression? It’s been hard to turn my thinking around and work toward the approach based on heading into the apparent nightmare rather than blocking it out. The first thing I’ve had to do is to shift from the idea that depression was something I had and see it as something I did. If I could understand everything I was doing that kept depression alive, even in a weakened form, then perhaps I could take the step beyond recovery that Tom Wooton describes. I could live with depression inside my comfort zone. In the next post of this series, I’ll describe how my behavior could still be supporting depression, even in the midst of recovery. I like the way you show that one can employ the skills learned in service of eliminating depression to shift the emphasis toward accepting feelings. Also, as much as I believe in embracing my full range of emotional weather, I still value feelings of contentment and affection. So there remains a place for working against negativity and not just caving in to it. Long ago, before anyone ever offered me an acceptance-based approach, therapists tried to teach me the difference between sadness and depression. It was a difficult lesson, but I gradually began to see sadness as a natural emotional response to life’s difficulties and depression as a behavioral reaction that kept me locked indoors and unengaged with the larger world. I don’t think behavioral depression of that isolating sort should be accepted, but the sadness that drives it is actually a normal and healthful response to life that’s worth exploring. The acceptance idea is a good one, but it is not entirely new and anyone who has been working with depression for as long as you and I have been already knows a lot about it. We just learned it with different terminology. You do a great job of describing the difficulties we face in deciding to quit battling our feelings and instead choosing to embrace them. And as you point out, in making this shift we can draw on the same skills we employed back when we wanted to escape discomfort rather than live fully in its midst while taking action to make our lives feel more meaningful. I’m struck by how those of us in the blogging community are collectively learning new approaches to our lifelong mood issues. It feels very hopeful to me. Thanks, Will, especially for making the distinction between genuine feeling as opposed to the fixed mood traps. 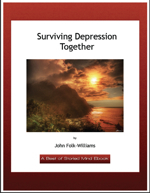 There were a couple of times in my life when the difference between grief and depression struck me with special force. The grief had such clear cause. I let myself feel it, express it, share it and run its natural course. I was happy to recognize the difference between that and the endlessly recurring grief of depression. I share your hopefulness about the blogging community. Each approach I’ve tried opens my mind to something new – I think I would start to get in trouble again if I became a fanatic about any one method. I have been practicing mindfulness and ACT for the last couple of days, and i am glad to say that i have found it really effective. It has helped me a lot in both understanding and managing my emotions, thoughts and feelings. Currently, i have been reading ‘Get out of your mind and into your life’ by Steven Hayes who is called the father of ACT. I beleive his work on Mindfulness is path-breaking. I’m glad ACT is helpful. I’m reading both Hayes’ book and the Mindfulness and Acceptance Workbook for Depression, which is less theoretical as well as aimed specifically at depression. Together, these two books have helped a great deal. Is depression something we do rather than something, an illness, we have? If depression is something we do, then it seems logical that the goal is to reach a point of acceptance, of balanced awareness, so we we can live with depresion inside our comfort zone. As I engage in my process of recovery (psychotheraphy, writing, praying, exercesing and implementing the other steps in the book The Depression Cure by Stephen Ilardi, PhD ), I am learning that, in many ways, depression is, in fact, something I do, a default mechanism I fall into to approach life, especially during times of great stress and emotional pain, such as career and relationship challenges. I started “doing” depression early in life, when I was about 7-8 when I felt abandoned and unloved by my mother who had left me in my native DR with my grandmother and aunts to move to NY. It started with,” If I am not with my mom by the age of 14, I am going to kill myself.” In a sense, I chose to embrace “depression” at an early age rather than fight it or replace it with a more positive and optimistic approach. And it continues. At the age of 46, with a twenty year old daughter of my own, the thoughts I choose to think and dwell upon and many of my career and relationship-related actions and choices perpetuate the presence of depression. To accept that depression is something I “do” takes deep courage and the risk of blaming and hating myself for “being weak and immature, for not knowing how to love myself, for not having the coping skills to endure, to withstand the hardships of life.” I must take that chance. This is part of becoming and active and committed participant in my recovery rather than a passive patient. The burden of responsibility, acceptance comes with a high price but it also brings liberating empowerment, which is my most powerful weapon against succumbing to the believe that I am a mess, that I am a failure, that I am defined by other people’s acceptance and rejection. As I discover and uncover its genesis, its permanence and reoccurences, the pain and the healing of depression rise to the surface and I implement the modest behavior and mind shifts one day at a time, one hour at a time, sometimes one minute at a time because that’s the best I can do in a particular day. I am really hard on myself; my worst critic and enemy. The behavior change is to stop the debilitating rumination on self loathing ; the mental shift is to accept and love myself, to accept mistakes as signs of strength and not cardinal sins, to accept that I am still worthwhile and lovable even if my husband no longer thinks so, to face my mistakes and failures head on and not kill myself. That’s a brilliant and moving statement of so many of the hardest problems in taking this view of depression. It feels strange to me to talk about doing rather than having depression, partly because of the tendency to blame myself for all the wrongs of life anyway. The road to healing seems so narrow, the danger of falling off a cliff so immediate. I think each new form of therapy brings a different aspect of emotional truth to the forefront of our thinking. I’m told that the most effective therapies are the newest ones and that therapies tend to be accepted and work for only a few decades. It may be that each one helps us understand what we go through a little differently. I’ve had that feeling in putting together several different forms of treatment and therapy over a long period of time. Each gives me another part of the picture, and each gives me new skills to work with. I’m not sure how important the acceptance and action approach will be for me, but it captures something that feels very powerful for healing, very true for well-being. Thanks for this thoughtful comment. I guess the exposure therapy would work if the depression is avoiding some kind of trauma. I’d prefer if the conditioning was more about increasing pleasure than just encountering fear. I think acceptance for depression is important with or without a specific trauma. You can’t get to a feeling of pleasure until the fear or despair fall away. The amazing thing about acceptance through exposure is that you can find a new pleasure in previously dangerous situations. There’s a post here I need to write to get clear about this. Thanks again for setting the thought process going. John, I think you are the most gifted blogger today on the topic of depression. I am looking forward to this series because I am currently on the same path since medication stopped working for me a few years ago and discovering mindful meditation last fall constituted a huge breakthrough for me. We must both be on to something! I can relate to your investment in the idea that you are “totally recovered,” yet have some nagging thoughts and feelings that demonstrate that you are not. As I type this, I am struggling with generalized anxiety. I’ve never considered “living with depression inside my comfort zone,” but I’m waiting with bated breath to see how this series turns out. We should compare notes on how we proceed in this direction. I think a lot of people are looking to new approaches, and the acceptance concept is the most promising one I know. I’ll be interested to see how the series turns out too. Thank you for your kind comment – hyperbolic, pre-morning coffee-ish as it might be! Excellent, thought provoking post. Exposure Response Prevention (ERP) Therapy, as you described, definitely works for OCD……with some changes in how depression is viewed, maybe ERP Therapy could work for depression also. Something to think about…. Thanks for the reference to ERP therapy – I hadn’t known that exact name. The exposure idea sounds close to acceptance, and I want to explore the studies on it.